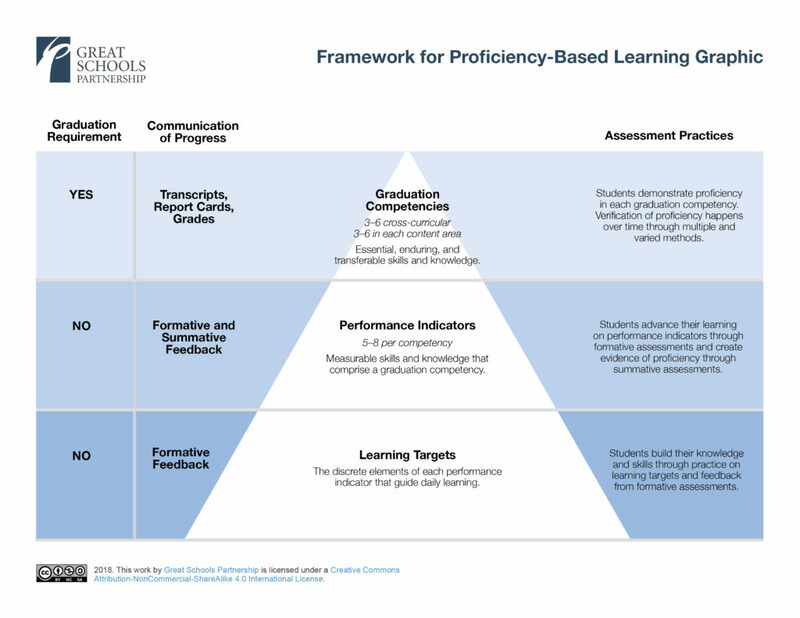 The Framework for Proficiency-Based Learning represents a system of essential structures necessary to promote equitable outcomes for all students. These structures help educators create coherence as they define and prioritize student learning outcomes, plan for assessment and feedback, select methods for communicating progress, and determine readiness for graduation. Learning outcomes include graduation competencies and performance indicators (long-term), learning targets (short-term), and habits of work. While these structures are critical, a commitment to the achievement of all students must serve as the foundation to ensure equity. The following definitions clarify the elements of the Framework for Proficiency-Based Learning. Graduation competencies are the essential, enduring, and transferable skills and knowledge that students must demonstrate for graduation and should be limited in number. Cross-curricular competencies apply across content areas—and are sometimes called 21st century skills—while content competencies are specific to a discipline. We recommend 3–6 cross-curricular competencies and 3–6 competencies in each content area. Students demonstrate achievement of each graduation competency over time and through multiple methods. Students’ levels of performance on graduation competencies are documented on report cards and transcripts. Every graduation competency is built upon a prioritized set of 5–8 performance indicators, which provide more detailed descriptions of developmentally appropriate skills and knowledge, and against which student progress is measured. These are commonly defined for the end of elementary school (grade 5), middle school (grade 8), and high school (grade 12). School districts also use student achievement on performance indicators in varied ways to determine proficiency at the graduation competency level. Student learning is supported by formative feedback which is clear, timely and aligned with performance indicators and learning targets. Formative feedback describes current performance and allows both teachers and students to monitor progress and adjust teaching and learning. Summative assessments measure student achievement on performance indicators, usually on a 4-point scale based on common scoring criteria. These assessments yield feedback for students that inform grades and determine, over time, proficiency on graduation competencies. Requiring proficiency on every performance indicator is problematic because it elevates the indicators to the graduation competency level, increasing the number of graduation requirements, and creating an unwieldy and inflexible system. Decisions about assessment and verification of proficiency within this model should be considered holistically to ensure clarity, coherence and efficacy within the system. Learning targets are the components of performance indicators, guiding the design of daily lessons and units of instruction intended to move students toward proficiency. Learning targets are the basis of teacher feedback, peer feedback, and learner self-reflection, and therefore they must be clearly communicated to and understood by students.